Pakistan became the first South Asian country to adopt the Right to Information (RTI)/Freedom of Information (FOI) legislation through passing the Freedom of Information Ordinance (FOIO), 2002. Near-identical laws were subsequently passed in Balochistan, the Freedom of Information Act (FOIA) 2005, and in Sindh, the Freedom of Information Act, 2006. However, since then Pakistan has lost its position as regional RTI leader to neighbouring India, which, in 2005, passed the world’s third-best RTI law. Pakistan has also fallen behind Nepal and Bangladesh, which passed progressive RTI laws in 2007 and 2009, respectively. 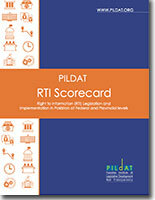 The RTI laws in Bangladesh and Nepal have been rated as 20th and 23rd best laws in the world. In comparison, the FOIO 2002 occupies a dismal 84th position on Centre for Law and Democracy’s (CLD’s) Global RTI Rating.